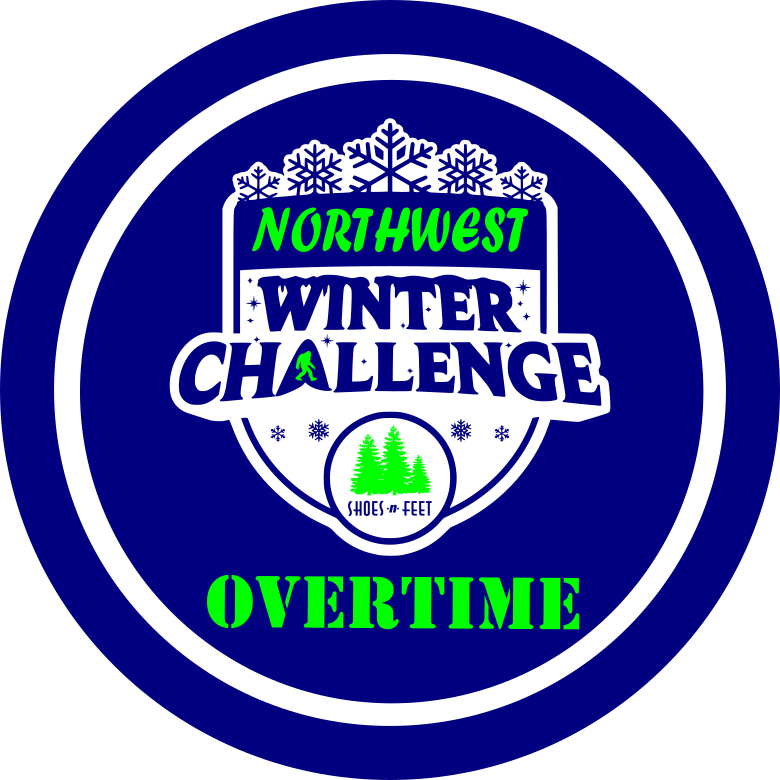 Overtime Warrior End of Challenge FAQ! Overtime is nearly complete, is your run log up to date? This email is intended to answer your end of Overtime Challenge questions. Remember that you have four days after a run/walk to log it, so the last possible day to log anything is 11:59 PM on Thursday, April 4. At midnight, April 5, we will consider the results complete. Please do not record any runs or walks in April in the Overtime Challenge run log, it will mess with the results. We anticipate that will have shirts and sweatshirts available to pick-up at SHOES-n-FEET starting Wednesday, April 17. If you elected to mail your shirts that process will also start on April 17. Expect to receive shirts and sweatshirts in the mail the 3rd week of April . One the results are final, we'll also mail out awards the 3rd week of Apri l.
Remember, the qualification for getting your name on the shirt is to have logged at least one mile each day outside. Please verify that you are on the Winter Warrior list by tapping or clicking on "Leaderboard" from the profile page, and then tapping or clicking on the word "Overall" to bring up the drop-down list. From the drop-down list select "Winter Warrior." You may also verify your status by noting that you have a small blue ribbon attached to your Gold, Silver or Bronze ribbon. Please also check the spelling of your name. Email corrections for spelling to adam.stuhlfaut@shoesnfeet.com . I'm sending the final list to the printer at NOON on FRIDAY, APRIL 5, 2019. NO CHANGES OR ADDITIONS WILL BE ACCEPTED AFTER NOON ON FRIDAY, APRIL 5, 2019. How do I get a nickname on the shirt? I sent an email on Friday, March 15 about shirt nicknames. If you did not receive the email, click here to read the contents . All nicknames are due on Sunday, March 31. Thanks, and enjoy your first day off! 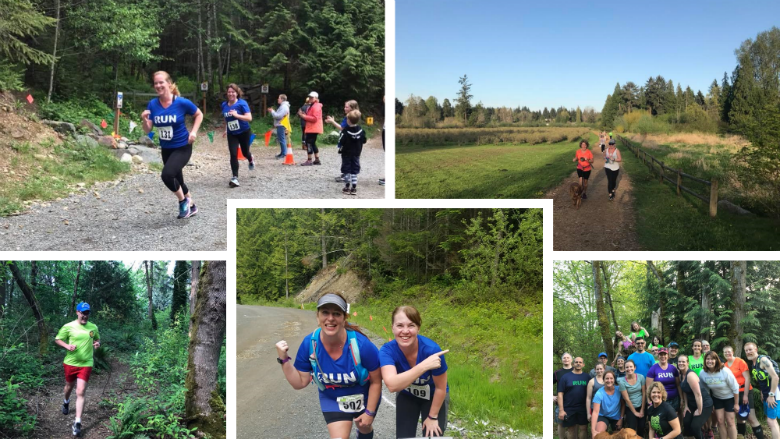 SHOES-n-FEET is partnering with Northwest Trail Runs to host this exciting event on May 5, 2019 at 8 a.m. 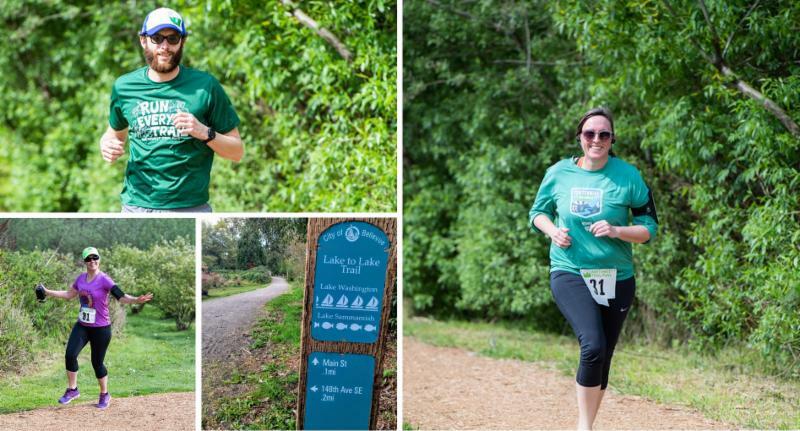 Teams of 2-5 runners will race on a 5k out-and-back route on the mostly wide and flat Lake Hills Greenbelt trails, with only a few short stretches of pavement. There will be a Hangout Zone set aside in the parking lot for each team to set up a canopy, chairs, etc. Think running race tailgating! We encourage team costumes and will be giving out spirit awards. We also have an option for open 5K and open 50K. Click the blue button below to learn more. Are you looking to hit the trails this summer, but don’t know where to start? Train with us on Wednesday evenings at 6 pm starting April 24, 2019, for a 4-week session on the basics of trail running! You will learn specific running skills that will help you on the trails including running downhill, running uphill, technical footwork, trail safety, course strategy, shoes, and gear. Click the orange button to learn more!